A new app by Dementia Australia aims to assist people in connecting and communicating when visiting loved ones living with dementia. 'A Better Visit' aims to assist people in connecting and communicating with loved ones living with dementia. Launched last month during Social Inclusion Week, A Better Visit is a free iPad app which includes a number of games designed to be interactive, stimulating and fun. Gamer, television presenter and Dementia Australia Ambassador Stephanie ‘Hex’ Bendixsen, says the games in A Better Visit allow family members of all ages to be more engaged when they visit a loved one living with dementia. “I cared for my mother Wendy, who died earlier this year from dementia and I wish an app like this had been available then because it can be challenging to come up with different things to do and talk about, especially as symptoms progress,” Ms Bendixsen says. Dementia Australia Chief Executive Officer (CEO) Maree McCabe says family members often don’t know how to communicate and interact with a loved one who has dementia, especially as their symptoms advance. “It may follow that other family members, children and friends start to withdraw and perhaps become less likely to include the person with dementia in everyday activities or schedule in regular visits,” Ms McCabe says. A recent Inclusion and Isolation report by Dementia Australia found that more than 60 percent of people said they didn’t know what to say to someone with dementia. 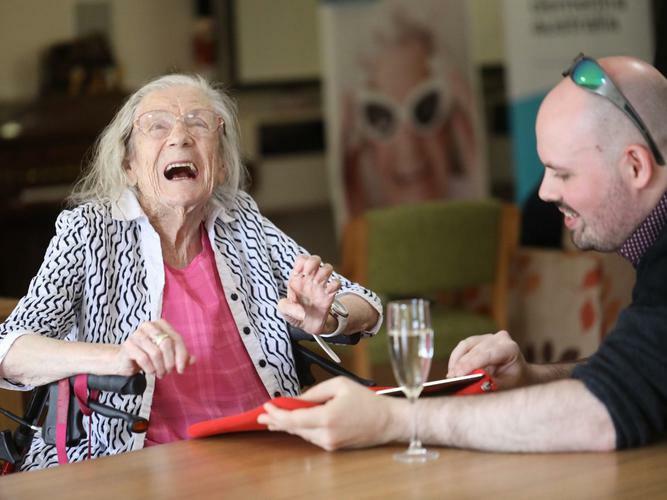 “By playing the games in the app carers and other family members will be inspired to engage with the person with dementia through the interaction, images and sounds enhancing their enjoyment and discussions,” Ms McCabe says. Lifeview Residential Care CEO Madeline Gall says the app is different from other products on the market as it was developed in close consultation with people living with dementia and their carers at Dementia Australia homes across Victoria. “By observing and listening to our residents living with dementia, researchers were able to tailor certain elements such as adjustable speeds, include classic songs to prompt toe-tapping and singalongs, and design clear buttons and uncomplicated instructions,” Ms Gall says. Ms Gall says Lifeview Residential staff would often see family members struggle to interact and maintain conversation with relatives living with dementia. “Through the stimulation and interaction via A Better Visit, we would hear more laughter and chatting,” she says. Further information about the app can be found here.